A lot of clients, especially from outside New England, ask me questions about lead paint. If you grew up in a mid-western subdivision where all the houses were built in the 1980s or later, lead paint is virtually unheard of. Then you come to Boston and suddenly there’s lead paint everywhere! It can be really scary to start navigating this issue when you’re in the process of buying a place, or getting an investment property ready for rentals. I’ve tried to compile some resources and general anecdotes below to introduce people to lead paint and its relevance to buying and selling houses. A great general overview to lead paint can be found in the EPA’s Steps to Lead Safe Renovation, Repair and Painting and the EPA’s website is probably the best source for technical information. Additional information on lead paint removal can be found on the Mass.gov Childhood Lead Poisoning Prevention Program as well as your city or town’s website: here are the links for Cambridge, Somerville, Boston, and Brookline to name a few. The U.S. Department of Housing and Urban Development website states that “when lead is absorbed into the body, it can cause damage to the brain and other vital organs, like the kidneys, nerves and blood.” The issue with children and lead paint is that lead tastes sweet and kids can get addicted to it. The classic scenario is a toddler puts a chip of paint in their mouth and finds that it tastes sweet. As a result, the toddler habitually starts looking for chips of paint everywhere inside and outside of the house. Alternatively, when a toddler is walking and holding onto lead-painted window sills, they accidentally bite into it and receive a rush of sweetness, which then conditions them to continuously start chewing on window ledges. Thus the wording of “mouthable surfaces” commonly used in lead paint regulations. Given that most houses in New England are likely to be built before 1960, you can see why lead paint is such a big deal in the real estate world here. 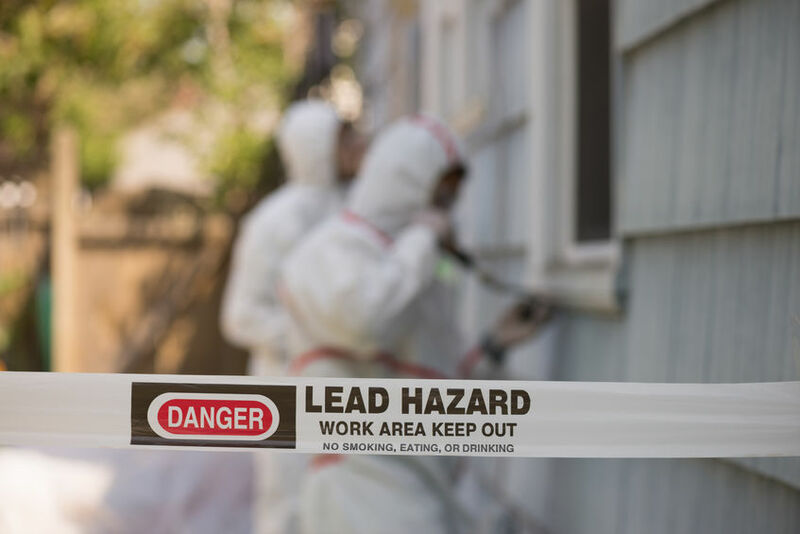 If you decide to mitigate lead paint in your home, you should plan for about one-and-a-half to two weeks for the entire process to be completed. Aside from the initial inspection, you will need about two to three days for the lead removal, depending on the size of your property. Time should be allotted should your home fail the initial re-testing for lead. Areas most commonly treated may include areas by the windows frames (both indoor and outdoor), moulding, and pocket doors, but really, any paint on the inside could contain lead. I would recommend to go with a lead inspector that is well-known or well-reviewed in the town of the property you are having deleaded. A lot of deleading is very town specific since you have to deal with the City Building Department. For contractors, I generally recommend to get a list from the Massachusetts State website and sometimes your local town will also have a list of approved contractors. You definitely want to get at least three quotes so you can compare and make an informed decision. Getting a highly recommended company that does high quality work is important if you have a mint condition home with a lot of original condition trim work covered in lead paint. If you have a standard fully depreciated hundred-year-old house in Cambridge or Somerville, you usually don’t care too much about preserving everything in its original condition so it’s okay to go cheap and just make sure to hire a good painter. It’s the painter that will make everything look wonderful at the end. The main dynamic with cost that I find is in the trimwork replacement. It’s highly unlikely that your existing trimwork is currently sold at the local woodworking or millwork shop. The popular shop around here is Anderson & McQuaid. If you have a home with wide 8” casings around your doors and windows, the standard trimwork can get expensive. If you have an original mint condition home, you may want to get customized casings milled that match the originals exactly. You’ll also want to get them in poplar (as opposed to pine or MDF) which can increase costs tremendously. The alternative is to have the original trimwork painstakingly scraped, which can cause you to lose some of the detail, or have the trimwork altogether removed and shipped to an off-site dipping plant where they dip the woodwork into a tank of paint remover. The decision-making can get daunting, I know! Remember to include the information on your property listing. Make sure to keep an eye on any peeling paint and address any touch-ups as they are found. While your place may be certified lead safe, there is still likely lead in all the flat painted surfaces like walls and ceilings and exterior. Any holes punched in the wall should be patched up immediately and any resulting dust should be vacuumed with a fully HEPA-certified vacuum. Regularly clean and maintain your house. Keep your paperwork handy. If you do rent your place out, you’ll need to provide all related lead paint certification paperwork to your tenant. There’s a place in the standard lead paint disclosure form where you and your tenant will have to check off and sign various disclosures about documents between transferred to each other.